Project ECLIPSE, with Professor Kay E. Vandergrift as principal investigator, was funded as an SROA Pilot Project by the Rutgers University Information Science Council in support of research investigating innovative uses of technology in education. 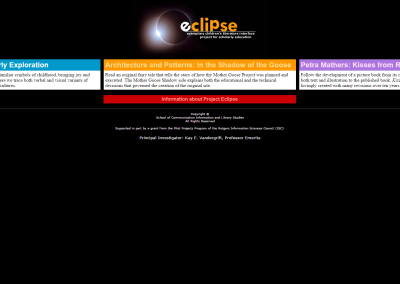 Project ECLIPSE both disseminates research results and investigates the process by which scholarly websites for graduate and professional education are created. It explicates the methodology for the creation of such sites and presents that methodology to professional colleagues. It also demonstrates strategies for the study and teaching of children’s literature using digitalized resources. The investigation of the development of scholarly interactive websites is both timely and relevant as electronic, web-based technologies are increasingly employed as strategies of teaching and learning. The changing nature of textual and pictorial media in the electronic age raises important questions about the evolution and development of materials for students, how to combine educational and developmental goals in designing new media, and how to provide access to cultural artifacts in ways to enrich intellectual and literary experiences of both adult and child learners. Despite an expanding number of teaching and learning resources available on the WWW, there is a surprising dearth of scholarly research for the professional education of the adults who create and provide these materials. Using the WWW to disseminate Project ECLIPSE offers scholars and students of Children’s Literature around the world access to both unique intellectual resources and digitalized versions of rare objects not commonly available in libraries or in standard courses on the History of Children’s Literature. 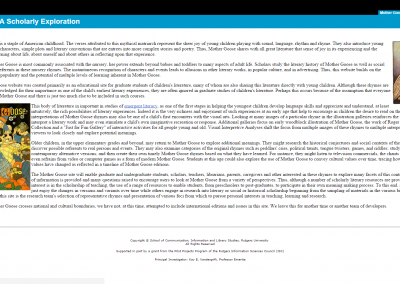 The methodological design rationale provides a system that not only contains cultural artifacts, but provides a reasoned infrastructure to deliver these objects in a web-based interface. 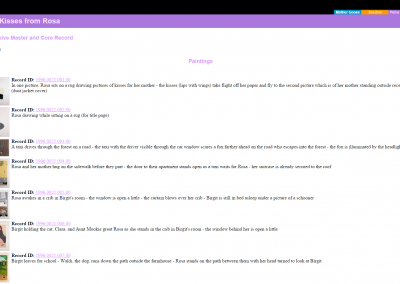 The implemented prototype serves as a proof-of-concept that can be applied to similar content in the domain of history of children’s literature and cultural artifacts and conceivably beyond to other discipline areas. The significance of this project lies in the research on the development, implementation, and use of information technology for web-based graduate education by the construction and use of a prototype model for creating such sites. The technical design may provide a template for similar information structures. This site was hosted from 1996-2015 at the Rutgers University School of Communication and Information.